If you’ve read my blog, heard me teach in person or have read my book, you may have frequently heard me talk about building courage for the impossible and the supernatural. This may challenge many people’s perspective or even be categorically rejected by popular thinking. But that is exactly what world changers do…they challenge, disrupt…even rebel against the norm. The future is advanced by the imaginers, the dreamers who will fly higher and closer to the sun. When you think higher, dream farther…you gain oversight and foresight. You gain clarity to the uncertainty that lies ahead, which is the challenge our economy and society is up against. We know something bigger, greater, stronger wants to emerge. But us Jesus Minded leaders understand that unlike in times past, we need you to lead us. I believe in fostering efforts of collaboration and mutual enlightenment. I believe the future will be created not in the efforts of a few but in the joint efforts of an empowered community. There’s nothing like learning from other sharp thinkers who are tuned into the heartbeat of Heaven and are exploring the edges, who have been given permission(as if they really need it) to be brave enough to say no to what’s been and realize they are alive with art in them that can paint the town red and change the world around them. God is doing a new thing, in new ways, with new people, new nations and new ideas. 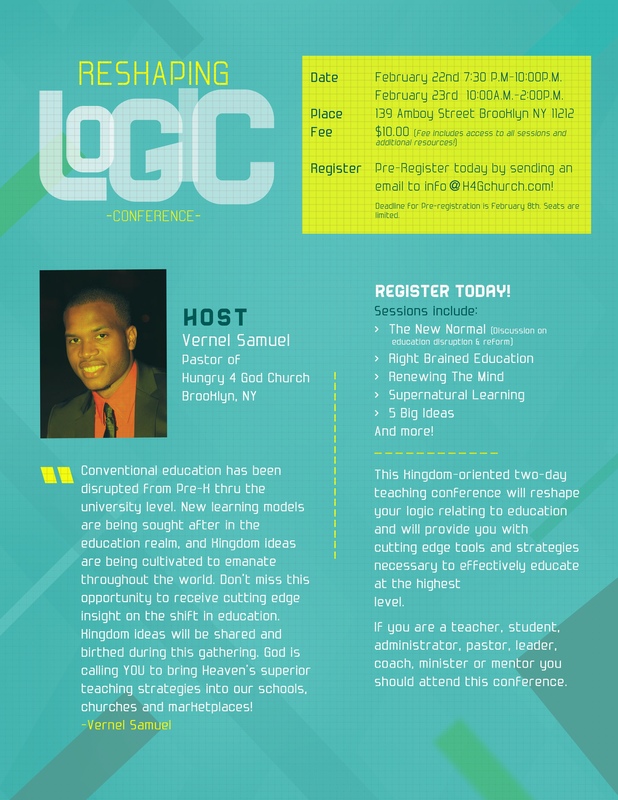 Hence the reason I’m hosting my first think-tank gathering this year called The “ReShaPinG LoGIc” Conference. It’s for Learners, Thinkers, Educators, Dreamers etc. Dedicated to hearing and sharing what Heaven is saying in order to re-position ourselves, our organizations, ministries, businesses and schools. We cannot solve today’s problems with solutions from yesterday. We need to renew our minds, unlearn somethings and reshape our logic. We are focusing this year on the Future of Education. The education system is experiencing wide-scale disruption from the conventional models of learning. It’s time to seize new ground. We are working without a map because there isn’t one. New schools and new education centers are in need as governments are recognizing once again that their greatest assets are the minds of their children. If we invest in them, we invest in our future, in far greater ways than stocks, gold, silver and bonds. 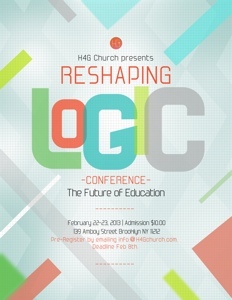 I have some of my prolific friends and family giving prophetic talks at this gathering on the future of teaching, learning along with practices that can redefine our approach to educating and can help you design a program for your area that can help develop world class leaders. So if your interested, set aside some time, mark your calendar and join me on February 22nd at 7:00PM-10:00PM and February 23rd at 10:00AM-2:00PM. The address is 139 Amboy Street bet. Pitkin and Sutter Ave. Only TEN bucks. It’ll be a great time to meet other people, learn new ideas, ask questions and walk away with great resources. It’s in NYC so you will have to travel to meet us. We’re working on digital broadcast so I’ll keep you posted! Hope to see you there!